Naturalist Sy Montgomery rekindles her dormant childhood desire to talk with animals in a narrative that shimmers with grace and wonder. Ten tales poignantly personify 13 critters both commonplace and exotic, from Tess the border collie and Chris the extroverted pig to spiders and octopuses. “Many young girls worship their older sisters… [Mine] was a dog, and I… wanted to be just like her: Fierce. Feral. Unstoppable,” Montgomery writes of Molly, her family’s Scottish terrier. Other animals she writes about live farther from home, and Montgomery tells of quitting a newspaper job to shadow emus in the Australian Outback and befriending a tarantula in the jungles of South America. In the cloud forest of Papua, New Guinea, she rediscovers “the wildness that keeps us sane and whole, the wild, delicious hunger for life.” Back on her New Hampshire farm, an ermine plundering the henhouse on Christmas offers a unexpected perspective on her difficult mother and a vivid dream of a deceased pet opens her heart to a new dog in need of rescue. Montgomery’s lyrical storytelling and resonant lessons on how animals can enhance our humanity result in a tender, intelligent literary memoir. One of the most poetic science writers of our time. With plenty of heart, acclaimed naturalist Sy Montgomery makes the convincing case that all animals—great and small—can teach us compassion. Ever since her parents gave her a Scottie puppy, the author’s fascination with the animal world has been insuppressible, and she made that obsession into a career writing about animals in more than 20 books. Here, the author looks at 13 of the most important animals in her life and how they changed her… The National Geographic channel meets memoir in this brief, compelling examination of what animals can teach us about ourselves. In a memoir that will speak to readers of all ages, naturalist and National Book Award [Finalist] Montgomery traces her life through the animals that have shared and enhanced it. From the briefest of encounters (a glimpse of a white-furred ermine) to the heartiest of friendships (a 750-pound pig called Christopher Hogwood), Montgomery offers a look at the insights about humanity animals have given her. Some, like Octavia the octopus, are creatures she has studied; others, like a series of border collies, have been dear companions. Montgomery is equally as tender and observant in her recollections of a pinktoe tarantula as she is of her childhood Scottish terrier. …This is an endeavor that is filled with heart and should be widely shared. Plenty of memoirs center on animals, but few offer such variety, passion, and care. 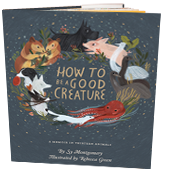 When asked by a journalist what life lessons animals have taught her, acclaimed writer and naturalist Montgomery hardly skipped a beat in responding, “how to be a good creature.” Here the award-winning author elaborates on what she has learned from the animals she has loved and studied. Unable to conform to her parent’s idea of how a young daughter should behave, this only child in a military family found her closest ally and a beloved friend in her first dog, a rambunctious Scottish terrier named Molly, and it appears from there on in her destiny was sealed. The author has traveled the world and worked with animals in the remote locations under less-than-ideal, often physically challenging, situations. However, it was the death of two of her beloved pets and a profound depression, accompanied by suicidal thoughts, that nearly brought an end to Montgomery’s career. What ultimately saved the writer was a return to work and the “wildness” of nature that she believes keeps us “sane and whole.” As Montgomery demonstrates again and again, it’s not only the “tools of inquiry and intellect” it’s also “heart” that allows us to glimpse into a world that “is aflame with shades of brilliance we cannot fathom.” Verdict: Filled with fascinating stories of encounters and relationships with animals in various locations, this moving memoir will leave readers thinking about life on Earth, the creatures we share the planet with, and that “brilliance” we have yet to fully understand. Sy Montgomery’s latest book is all about the pleasure that comes from a life rich with many creatures. How to Be a Good Creature, though, is about more than appreciating animals: It is about learning from them…. Animals are observant. Animals are loyal. Animals only attack when threatened. Animals respect the world they live in…. Animals love homeless people and members of the one percent equally. Animals don’t care about your job or your power or your fame or your status. Animals value you for the content of your character. This is why we should follow Montgomery’s advice and be more like animals ourselves. In other words, Montgomery’s book promised many of the same ups and downs of animal stewardship. Finally, just a few days before this book review was due, I sat down and began to read. I’m glad I did. She is good at evoking the joy. Montgomery is one of us, one of those people who respects animals and who intuits the depth of their intelligence, psychology and emotional range. Despite how distraught she became when her animals died, she found perspective. In her struggles, she brings herself and her readers through the dark times. She can’t help herself. She carries on, finding new creatures to befriend, and, through them, new life lessons…. Montgomery writes books for adults and youth. This book has appeal for people of all ages. The language, beautiful and poetic at times, is filled with feeling and propelled by a quest for more – more knowledge, more adventure, more connection. It is, as promised, the story of a life lived in close proximity to animals. While that life is a privilege, it demands much of those who open themselves to animals and the environmental catastrophe that now imperils the wild world. It’s clear that Montgomery views every creature that she meets as a unique individual, with their own personality, needs, and desires. The animals in How to Be a Good Creature are complex, fully-fleshed characters. So, what helps Montgomery discover an animal’s character? “I think just the ability to be quiet, and to listen, and to open your heart. It’s just being still,” she says. Most readers will know Sy Montgomery as the author of titles about animals across the globe that she happily joins scientists in tracking, such as Kakapo Rescue: Saving the World’s Strangest Parrot and The Great White Shark Scientist. Here she turns to memoir to explain her relationship with animals, starting with her childhood reliance on Scottish terrier Molly and her finding her calling when she got involved with emu research in Australia. Though she traveled the world to document various animals, it was her beloved border collie, Tess, and Tess’ successor border collies, plus friendly pig Christopher Hogwood, that have brought the most meaning to her life and filled it with joy. She portrays animals at home and far away with keen and loving eagerness, and the account of animal- rich life on her farm with her husband has an idyllic tone that recalls mid-century animal-loving writers ranging from E. B. White to Sterling North. She also writes, however, with honesty about her difficult mother and bouts of depression, and the role of animals in her negotiation of both; her daunting struggles with loss, an inevitability when dealing with comparatively shorter-lived animals, are poignantly described. Readers will be drawn to the animal tales and the pastoral dream life, but they’ll also appreciate the acknowledgment of life’s darker aspects and the way connections with animals can bring important meaning to human lives. End matter includes a section of candid black and white photographs of the author and animals she’s known over the years, a personably annotated list of books that influenced Montgomery, and a list of her own books. The Army pediatrician assured her the pony phase would wear off. It did—but only when I disclosed that now, I was really a dog.